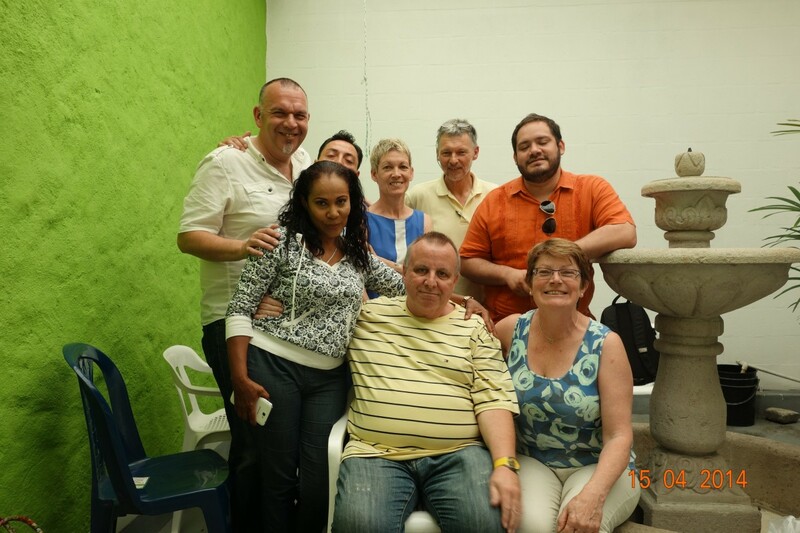 Where do I start to summarise the trip to Cali, Colombia, that ended last week….? It’s so hard to know: and I’m very aware, especially for those of you who have received (and hopefully read!) my newsletters that come out twice a year, that always I say about Cali – ‘the last trip was the best one ever!’ 52 visits to Cali, over 17-18 years, and 64 all told to Colombia, I’d quite understand if some think it’s just hype, but honestly, it isn’t. It’s one of the many reasons I love to take people with me, especially people who’ve been more than once. It’s impossible to ‘pull the wool over the eyes’ of a whole group of people who’ve been there with you, and on earlier visits. Chris Spark Fantastic in every way Paul. I will always be grateful for the impact being with you in Cali has had on me. As with previous years I won’t make any rash promises about future visits, but like you, Cali and its people are in my heart forever, and I can’t imagine that it will be too long before I come asking you again if you have a space for me on your team! Considering that the team was drawn from 5 countries (if you count me as being from Northern Ireland!) – Mexico, France, Holland, England – it took absolutely no time to ‘gel’, and it was a joy to have the biggest team I’ve taken for some years, all honouring each other, and having wonderful times in churches, and a lot of fun in between. Beny, from Mexico, was with me in Cali last Easter, but Chris apart, the others were all first-timers. When you go on a trip like that, you go earnestly wanting to bless the people you go to: what normally happens is that YOU get blessed far, far more than you could ever bless. Back in 1987, I discovered (in Hong Kong, so I couldn’t back out!) that I was taking teams and Bibles into China. My heart then, once I’d asked God to deal with the fear and the nerves, was to bless the poor, persecuted Christians in that country. 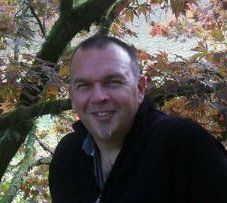 When I left China for final time on that trip, I realised that I’d ‘met’ a God I didn’t even know, a God who raised the dead (I’d met two ex-dead ladies on my first visit), and came back to the UK absolutely blitzed by the God of the Chinese, for whom nothing – absolutely nothing – is impossible…. We did enjoy very much this time together with you. We would love to join next Easter, God willing. 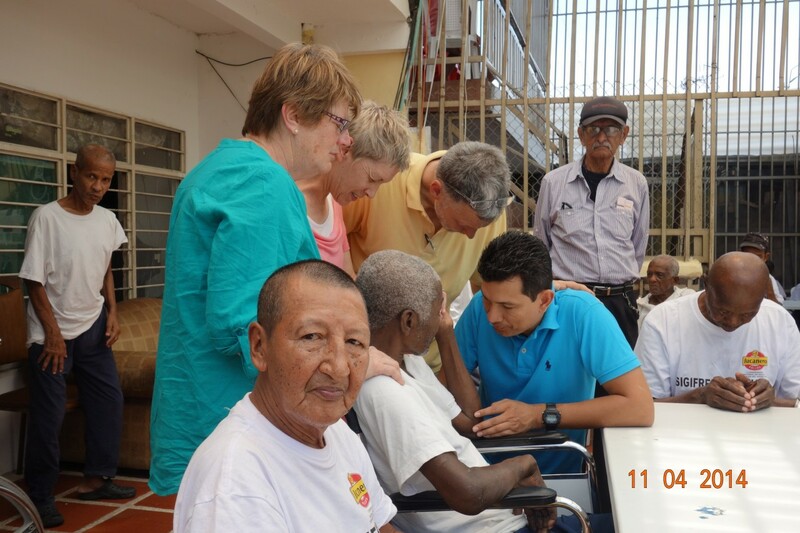 Elisa, Lydie, and Gerard, praying for a blind man at Ana Beiba’s home, with Wilmar Gomez. Hundreds of people, literally, received instant miracles, from long-term pain going, to steel disappearing in one lady’s ankle, to deaf ears opening, to lame people walking, to nearly-blind eyes seeing perfectly, to cancers going….hundreds, maybe into 4 figures, more, saw their healing process begin, and a number receiving salvation….I won’t repeat all the stories I’ve blogged, don’t worry! – but the blogs are pretty much just what I saw God do: there were six others who have countless stories of their own…. My friend, Dario, becoming an even closer friend, and blowing me away with his saying ‘I KNOW that God IS my Father’: that’s revelation, and it’s only something you know about, or know to SAY, when you’ve encountered and given your life to Jesus…. yes, he still has his ‘businesses’, but in that culture, and having been born into that lifestyle, you can’t just STOP, until the day that you also know that God is your protector. 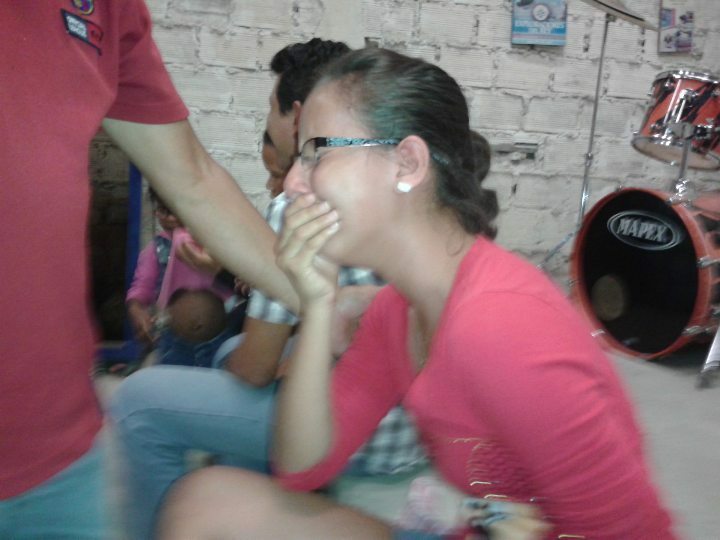 Daniella, November 2013, already healed of asthma, gets arches in her feet, just ahead of having God heal her eyes..
for this one!’, and seeing her face as she did what I did with her in November, taking the child’s shoe off of the first foot, and seeing the arches form even as the shoe came off. She erupted in tears, of amazement and shock, and again when the same thing happened with the other foot…. Then her mum, with the same eye condition, but not quite so bad as Daniella’s had been, came to us. I told her it’d be lovely if she prayed for her mum: again did what I did with her 5 months back, and mum getting her sight back instantly…. Perhaps the steel plate and screws going from Eva’s ankle should be in there, too! 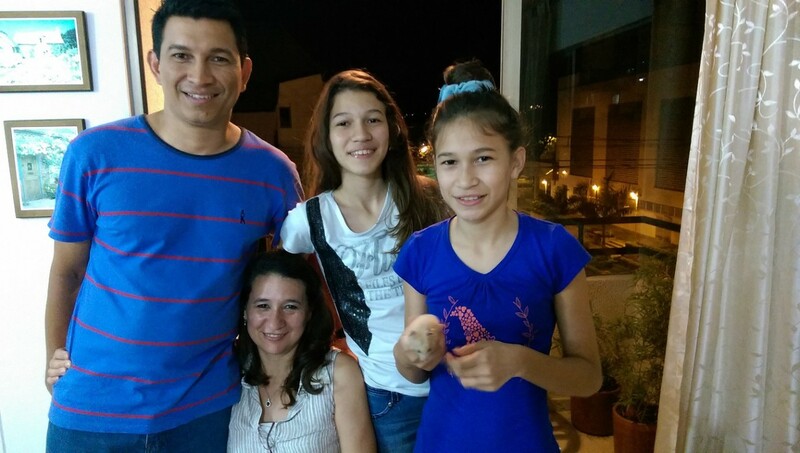 – oh, and Ana Beiba being healed of cancer, for the second time (November 2011, God removed a huge brain tumour, which she felt go: just as she did the tumour in her throat two weeks ago…. Eva, whose left ankle was giving her great pain, with a badly-inserted steel plate: she couldn’t move her foot in any direction, until God stepped in…. Amazing, astonishing, astounding, Almighty God…. who uses the weak and foolish, thankfully, as I’m both of those: and who, because of Jesus, seats us in Heavenly places, with a position, in His eyes, that will always be greater than our performance. Thank you, Father God. Thank you, Jesus. Thank you, Holy Spirit. And thank you Gerard & Elisa Zeiltjens, Lydie, Beny Osorio, Danny Ortiz, Chris Spark…. 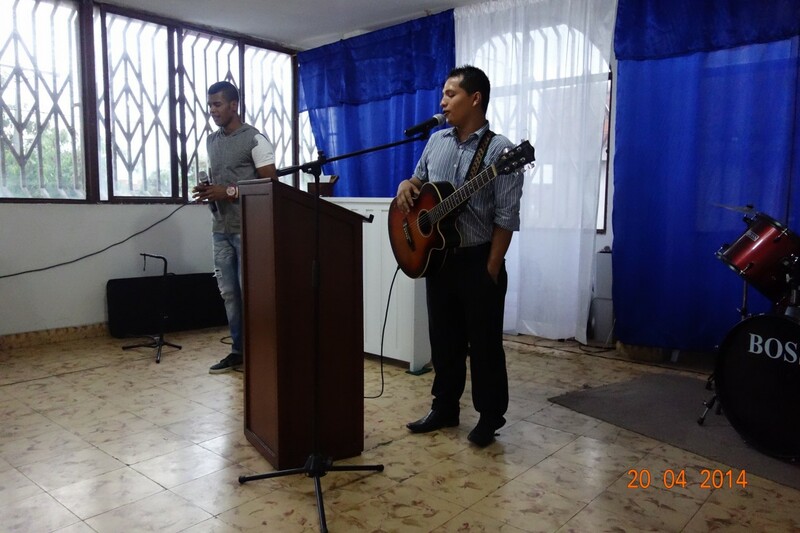 even greater thanks to my dear friends, Rev Dr William Castaño, andPastor Wilmar Gomez, for such a great, organised programme, stress-free because of them, and additional thanks to them for trusting me, and the teams I take to Cali, to be in churches that I’d never know about. And thank you, all of you, who read, prayed, and encouraged me, and the team, over the three weeks we were there. God bless each of you, outrageously…..
Home! But boy, do I miss Cali…. Always, at the end of an amazing trip, the journey home can seem interminable. For my poor French friends, Gerard, Elisa, and Lydie, it WAS interminable – well, almost! They were on a different flight to me back to Madrid – for them, then on to Paris: 8 hours before mine. So they left the apartment at 11 am: I left at 6pm, but made a very important stop on the way, and got to the airport at 8 pm – only to be greeted first by Lydie, and then the others. There had been a massive storm – and Andes storms can be unbelievable – over Bogota, and all flights in and out had been cancelled. It was obviously a long storm, too, as there was no chance of them leaving Cali that night, and had been given hotel accommodation by the airline. I need to call them today to find out if they’re home yet! I was much more fortunate, in that I was going direct from Cali to Madrid, and we left on time. Better still, I was upgraded to ‘Clase Ejecutiva’ (Avianca Airlines’ Business Class) to Madrid, about a 10 hour journey, and that, mercifully, includes seats that go flat into a bed….I never can sleep sitting up in planes, so to get a few hours, plus good food, is such a blessing, and one of the ‘perks’ of flying regularly with the same network of airlines. But the sadness at leaving behind such an outstanding trip was immense, especially to go to the airport with Wilmar, Marlene, and their lovely daughters, Sophie and Sara, and to leave them there….still, it was lovely to see the French folk unexpectedly (for me – not them, as they’d rather have been en route from Bogota to Paris! ), and ‘Subway’ had a good few minutes as we stuffed ourselves with their great food…. About 5pm Tuesday afternoon, I had a call from Wilmar to say that my friend, Dario, had come round from the anesthetic, and I so wanted to see him again before I flew out, we made a detour via the hospital, and spent a lovely 20 minutes or so with him, his mum Lileana, and his brother, Stephen. I still find this deepening friendship so, so amazing, it has to be a ‘God’ thing, and most clearly is. Dario and his mum were so happy that I’d even think of going to see him so close to leaving, and God was clearly in that short time we had together too. 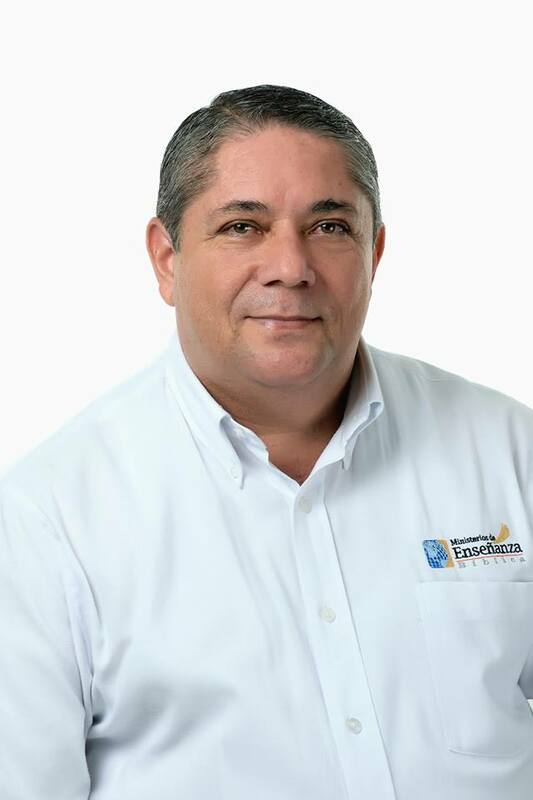 I’ve heard from Wilmar today that our prayers for rapid recovery from the surgery for his hernia were answered, and he was home the next evening. I’d love to be able to tell more of the story, but, because of who he is, it would – honestly, no exaggeration – endanger him terribly…. When I got home, I felt pretty good, but then as the day went on, I think the impact of the trip, the journey, the busy-ness of the trip, the drop in adrenaline – all kicked in, and I went from ok to totally exhausted in a short space of time! I desperately tried not to sleep during the day (failed! ), tried not to sleep watching football on TV in the evening (failed! ), and was then concerned, having slept when I didn’t want to, wouldn’t be able to sleep when I ought to! No worries on that front – I tried to read a bit before I slept – I nearly always HAVE to read for about 30 minutes at least before sleeping – but I don’t remember much after picking up a magazine… until mid-day today! I think I really WAS tired….!! Thank you – ALL – for your prayers for this trip. They were answered – and then some. I think it’s all too much of a ‘blur’ still to try and do a summary, so I’ll perhaps attempt that tomorrow. I am so grateful to you all who have prayed, shown more than passing interest, in the team I had with me – the biggest team (7) that I’ve taken there for about 8 or 9 years. The guys all gelled together so well, and it was a joy to have them there. 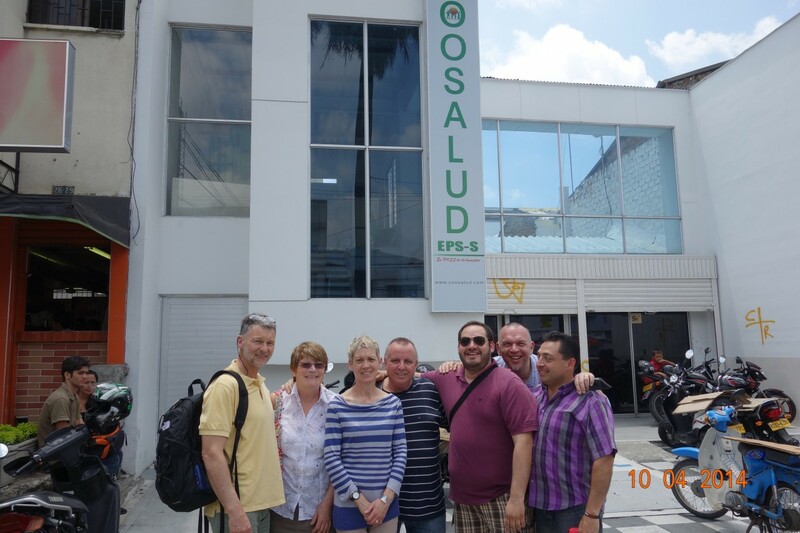 My thanks to the wonderful Rev Dr William Castaño, my great, great friend Pastor Wilmar Gomez, for organising such a well planned, stress-free trip, and to all the wonderful churches and their Pastors, whom we had the privilege of being with. And thank you, Lord, last but by no means least, for hundreds and hundreds of miracles and healings over the 3 weeks….it is totally humbling to see God do what ONLY God can do – through you…. So, now the mundane – I still haven’t unpacked – that’s so unlike me, as it’s always the first thing I have to do when I get home, and catch up with a stack of mail, emails, and the ever-present and much loved dirty laundry…. What an incredible 3 weeks this has been. It ran out of superlatives a long time ago, and even if I could think of others, yesterday would have ensured I couldn’t think of one that even began to do justice to what God did in the afternoon…..
Gerard, Elisa, and Lydie have gone now: I have a quick trip to the city centre to make, and then the lovely Wilmar Gomez comes to take me to the airport at 6 pm (its 12.30 pm now). I’ve doubtless said this before, but normally, in the last couple of days of a trip, I find myself thinking … ‘the day after tomorrow I’ll be home’, then ‘tomorrow…’ – but Cali is the one place where I’m always sad to leave, but deposits for the apartment have been paid to the very kind, friendly owner, Alberto, for trips in June/July, and October/November, so that makes the leaving a little easier….so I’ll be back, all being well, in 65 days! And thank you, Father God, Jesus, and you, astonishing Holy Spirit, for doing what you do best – changing lives, performing miracles, healing bodies, minds, and hearts. And for using me, East-Ender jobsworth, and my lovely team. And thank YOU, who’ve prayed, written, encouraged, and blessed me, and read my waffling here. Well over 2,000 hit the blog this trip…. If you’re in Cali, and want the best fruit juice, then Manuel’s (back to the camera) stall on street 14 -5 is the place to go! have one of friend Manuel’s wonderful fresh fruit juice drinks. It was hardly an exciting shopping trip, as it involved getting two extra sets of apartment keys cut: the mystery of where the others went still remains… Chris left them on the living room table with my phone, but they must have been raptured! There’s absolutely nowhere to lose them…. We had a wonderful time with Dario at lunchtime: his family and his mum, Lileana, were there, and his pet parrot from the ‘finca’ (mountain estate), Lulu, was also there, pecking at our feet while we ate! Dario’s a bit like the apostle Peter’s brother Andrew. He can’t resist asking other people to to come and meet us so we can pray for them. We had a great lunch, and then Erica (Dario’s lovely wife) ‘s mum and aunt turned up, then his brother, and a few others! It was great getting to know his family better, and I had a lovely chat and pray with Lileana, while Elise, Lydie, and Gerard talked and prayed with Erica’s family. The friendship with Dario and Erica has become something very special, and he often says to me ‘you’re always in my heart’ which is such a blessing, and yet on a purely ‘human’ level, such an ‘unlikely’ friendship, if you remember a little of the story. We had a truly lovely time praying with them, and their ‘home-help’ (maid here), Elsy… I lost count of the number of the number of hugs, with the whole family, including their lovely daughter and son. have one of friend Manuel’s wonderful fresh fruit juice drinks. It was hardly an exciting shopping trip, as it involved getting two extra sets of apartment keys cut: the mystery of where the others went still remains… Chris left them on the living room table with my phone, but they must have been raptured! There’s absolutely nowhere to lose them…. We had a wonderful time with Dario at lunchtime: his family and his mum, Lileana, were there, and his pet parrot from the ‘finca’ (mountain estate), Lulu, was also there, pecking at our feet while we ate! Dario’s a bit like the apostle Peter’s brother Andrew. He can’t resist asking other people to to come and meet us so we can pray for them. We had a great lunch, and then Erica (Dario’s lovely wife) ‘s mum and aunt turned up, then his brother, and a few others! Up the mountain, to a church, where heaven touched earth: a great way to end our meetings here! Three wonderful churches today: first, Wilmar and Marlene’s ‘El Abrigo International’, where it was my privilege to go, and Gerard, Lydie, and Elisa went to a lovely Baptist church somewhere in the city…. the worship at El Abrigo is always wonderful: so many good musicians ans singers, a lovely platform from which to speak. Hein translated for me: he’s so good, and so quick. He was the first person ever to translate for me here in Cali, in 1997, so we know each other pretty well by now. 8, maybe 10 people, came for prayer: all of them with ‘obvious’ sickness/pain/infirmity (by that I mean not internal!) were healed. Yup, more knees, I got two of the Apeople to kneel as that’s pretty much an impossibility with badly arthritic knees. They did. a lady with something similar to plantar fasciitis, another with a lump close to her spine and in a lot of pain, left pain-free; one lady had intense pain in the top knuckle of the fourth finger on her left hand; it went (the pain, not the knuckle), and so the story goes….there’s something about this city that accelerates gifting you might have, and might or might not use back home, and it’s so easy to pray for pray for people. I know for myself, that the gift of faith has grown and grown here, in me, over the years, and it’s good to go back to Europe, or anywhere for that matter, knowing that people will be healed. Then, off to Dario’s cousin – that deserves a blog of its own! Earlier in the week, we had to cancel a meeting in a small town, La Cruz, high up the most unreal road in the mountains, as we couldn’t get a translator. 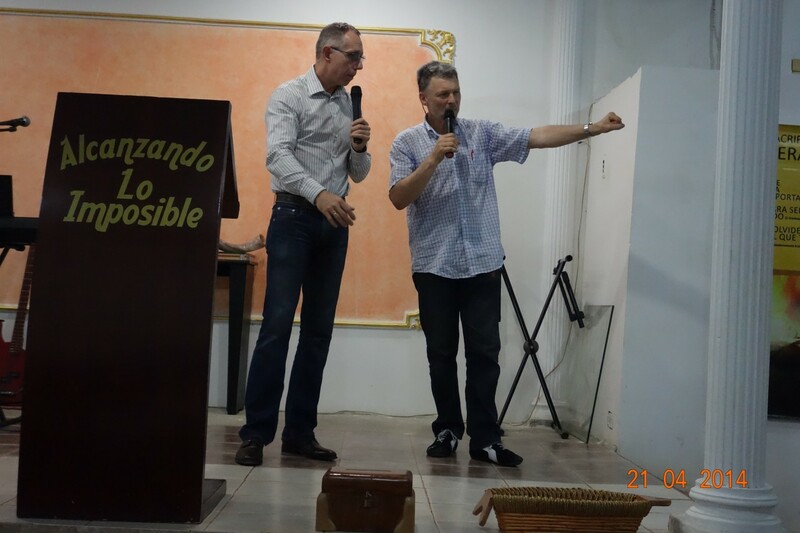 It’s a church i love, Alcanzando lo Imposible – Reaching the Impossible (I think that applies to the road to the church! ), Pastored by Giovani and Luz Helena Cruz. It’s a fantastic church, and Giovani had asked if we could go tonight instead, and I jumped at the church for my French friends to go there. You can hear the church long, long before you get to it: the P.A. is so loud, and I’m sure the drummer, Robert, must have to replace his skins at least once a month as he hits them so hard! The place was packed, and rocking, when we arrived. The praise and worship was great, if a little deafening(! ), and folk from the church, who’ve got to know me over the past year or so, welcomed me/us like long-lost friends, even though I preached there only 2 weeks ago! Giovani was very honouring to us, which is always such a blessing – dishonour has been a church curse in many countries, and thankfully God is bringing it back to the churches humble enough to honour others. 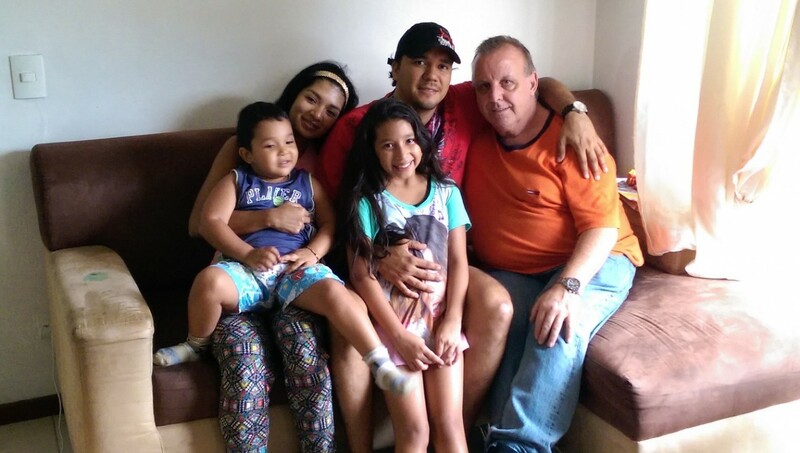 I prayed with people with Wilmar, and it was so wonderful to see God heal many of them. A lot of the ‘usual’ stuff, as always, knees, one young mum, with three young children, had a mother deeply into witchcraft, and she and her kids all suffered nasty stomach problems as mum evidently didn’t like her daughter being a Christian. God visibly set her free from the fear, and I’m sure, the nightmares. It’s wonderful watching fer HAVE to leave people, their whole visage – and their eyes – change. Loads more – but one (for now!) final, lovely story. A husband and wife. Oscar (I think) and Dora, both had several serious issues. Dora had great pain from damaged ovaries, and a bladder problem, as well as strong lumbar pain and diabetes. Oscar had fast, degenerative myopia, with a prognosis of total sight loss before long. Dora got her pancreas dealt with first to sort out the sugar balance, then her back, which was healed instantly, as was the pain in her abdomen. On the premise that Jesus never ‘half-healed’ people – he never said things like ‘I’ll heal this, but not that’, or ”You’d better go and get surgery’ – it’s pretty safe to assume that Dora’s diabetes is gone. She’s not due another sugar test until mid-May, and I’ve asked her to tell Giovani who’ll tell me, when she shocks the docs… Oscar’s miracle was lovely. He had very little sight out of a very small portion of his left eye, little better in his right. As he was prayed for, what he described was happening to his left eye was as though curtains were being opened, and more and more vision was coming to him….I felt that God would complete it in both eyes overnight. I hope Giovani lets me know! And so a fantastic (nearly) 3 weeks for me, 2 for the French folk, 12 days for Chris, and 8 for Beny and Danny, comes to a conclusion, on Tuesday, after more time with Dario on Monday and Tuesday (morning). Thank you, Father, for the hundreds healed, a good number saved, and hundreds more healings in process. After 52 visits here, it still amazes me even though I expect it, if you can get what I mean. L LOVE ths country, and even more, this city…. Last night, Dario told us that his cousin, Lorena, whom I met last year and prayed for, as she was desperately ill with cancer, had improved after that, but a few weeks back, suddenly hit cancer’s awful ‘slippery slope’ and was now critically ill. I asked him if we could go and pray for her: thought at first it was going to be in a hospital, but it was in Lorena’s parents’ home. My little heart sank, as I remember that it was a first floor apartment, with a very dodgy staircase, outside, and open – no fence or handrail – on one side, and unusual stairs – depth, width, and height…. 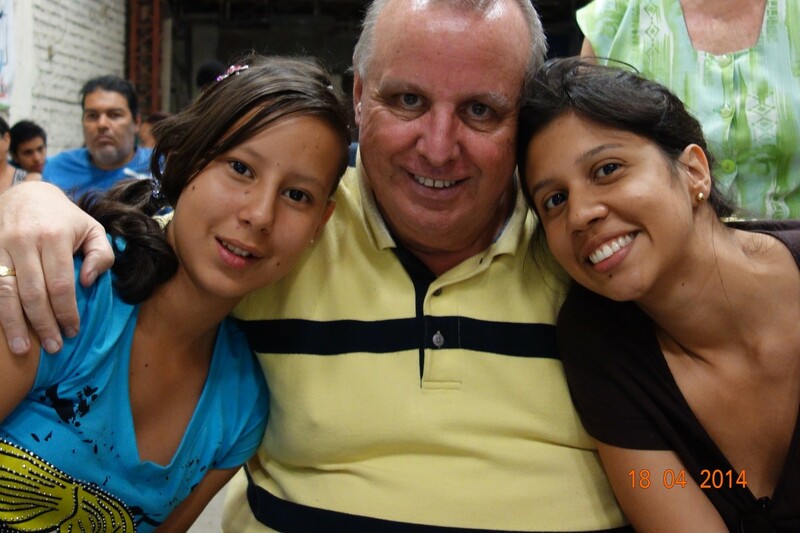 my knees wanted to object but I wouldn’t let them, and when we got into the house, Lorena was in awful pain, and gravely ill…. She was unable to speak, move any limbs, her breathing was very shallow, and she was pretty nearly yellow. She also had an infection in her flesh that eats the flesh and creates an ungodly smell. 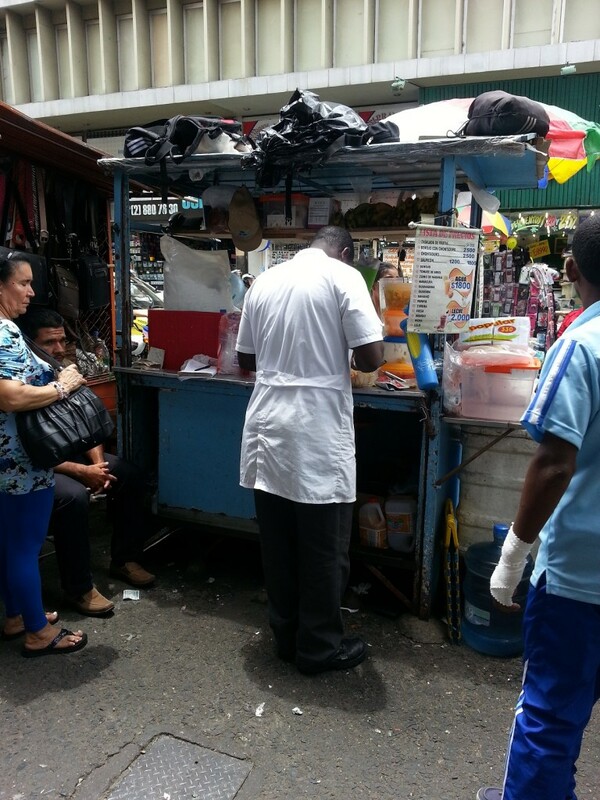 Elisa and Lydie are both nurses, and they’d seen/smelt it before…. all of her family were there, and Dario and his family: what’s more, Lorena’s sister got her three children – well, pretty much grown up children! – on Facetime, as they’re in Dallas, where Lorena used to live. What happened next was really quite astonishing. I prayed a now often-prayed prayer, breaking her free from the spirit of death, which with most cancer sufferers always arrives in force, and broke the ‘power’ of diagnosis, and more specifically, prognosis off of her. Then prayer for peace, and – you might think I’m crazy here – joy: well, the joy of the Lord IS our strength, unless we only believe that awesome promise as ‘words’ and not reality, and I’ve seen a number of people healed as they laughed…. 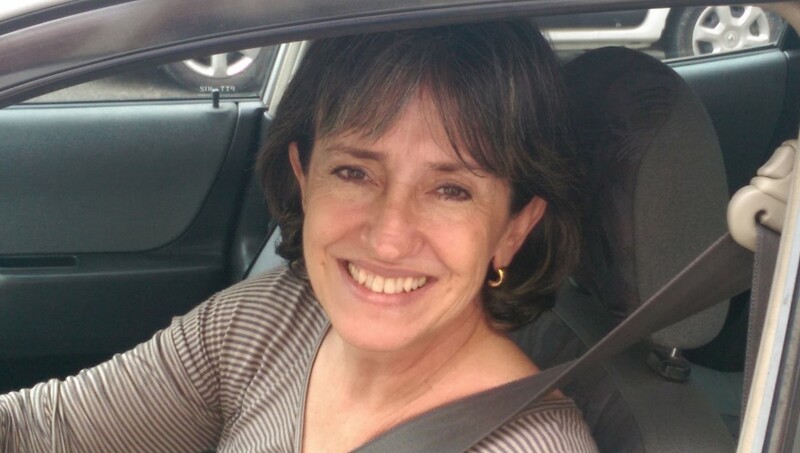 Lorena began to smile, then began to talk (she couldn’t before), her skin changed colour to a more typical Colombian colour, and then, to HER utter astonishment, she lifted up her arms, and legs, which she had been unable to do for some time. That led to another mass of prayers for others in the family, including Lorena’s mum, who had….guess what?….an osteoarthritic knee, incredible pain in the left knee, which was a prosthesis (convinced me even more never to go down that route myself even if my pain increases). Understandably, too, she had spent a large amount of time crying, for weeks, until her daughter started to speak, louder and louder, and move more…. Elisa and Lydie prayed for her sadness, grief, and I got to have a go at her knees (! )… ALL the pain went in the right knee, instantly, and it took three attempts to pray the pain out of the left leg with the replacement knee… she couldn’t believe it! Prayer for many others in the family followed, and the Presence of God filled the house…. it was wonderful, a real move of God, in dad, cousins, other relatives as they were healed and set free from all sorts of things. I’d thought we might be there 20 minutes…. an hour and 40 minutes later, we HAD to leave as we were being picked up for church! Dario asked us to go to his home tomorrow for breakfast, though that has ‘morphed’ into lunch, which is actually quite helpful to us, as we’ve got a fair bit to do tomorrow as it’s the last full day for the French folk, and I’ve got a few extra hours on Tuesday, which Dario has asked me to spend with him…. And all on Easter Sunday! Jesus truly is ALIVE!! Our sins are forgiven, our pasts are erased, our lives are transformed, and our futures secured…. THANK YOU, THANK YOU, THANK YOU, JESUS…. LORD OF LORDS, KING OF KINGS, SAVIOUR, BROTHER, FRIEND….. what an amazing God we have! I heard this song recently, via a post on Facebook sent by a good friend (thank you, Dave Arthur! ), and it is so, so powerful: it’s called ‘FOREVER’, sung by Kari Jobe and with Brian Johnson and the Bethel Church, Redding, California band: I’m just going to let it speak for itself, s it had me in tears, without adding more of my waffle…. Today was very special. It began with the ‘remnant’ of my team here,Gerard, Lydie, Elisa, and me, praying for each other, a very lovely time of healing, blessing, and affirmation. I’m not a great ‘believer’ in ‘in-depth’ ministry times on trips away, for a number of reasons: often in (many) years gone by, teams have had long ministry times ‘to get right with God’ – when you’re on a ministry trip, the getting right with God should be done before you go, or stay home! Trips are often intense, and very busy, so my ‘style’ is to relax, enjoy each others’ company, go to a cinema, or a nice restaurant, relax, laugh, have a beer or a glass of wine (or both, preferably! ), not fight internal angst that should never rear its ugly head while you’re away…. but today was so relaxed, not long, but a great blessing. A quick dash to the supermarket as we had no food of any description in the apartment, and then, late afternoon, heading off to two different meetings: the French posse to Wilmar and Marlene’s church for their 20th year Church Anniversary thanksgiving: me to another tough barrio in Agua Blanca, Retiro, to the lovely church pastored by Mauricio Naspiran, a real lovely guy whom I met last year and had the privilege of praying for. He’d been ‘broadsided’ while on his motorbike – there are tens of thousands of them here, mostly hairdryer on wheel engine types… 🙂 – by another motorbike ignoring a red traffic light. Lots of people to pray for, the first five healed instantly, including the now-obligatory arthritic knees! Four arthritic people all received God’s healing tonight: Mauricio’s dad, with a lump in his throat (not cancer, thankfully) which affected his speech and gave him a lot of discomfort, was healed. His mum, too, of pain in her back, and leg… as always here in Cali, there were diabetics, whom I encouraged to go home and do a sugar test straight away…. I’m convinced they were healed, though I may never know definitely, but one had arthritis, and God healed that, and as far as I’m aware, in the gospels, Jesus – nor any other of the ‘big guns’ – Paul, Peter, etc., left people half healed. They were totally healed. So a great night…. topped off with a lovely surprise, one that I’ve been praying for and longing for on this trip: initially a phone call from my friend Dario, who invited me to go for a meal with him and his family… I couldn’t, as my meeting went on longer than expected, and I have the only key to the apartment and couldn’t leave La Francaises outside! 15 minutes after I got home, the doorbell rang, I answered expecting to see Gerard et al: but it was Dario, Erica, Michelle, and Joshua. I was over the moon, as I’d not got his current contact info and someone had given his mum the wrong phone number for me…. 🙁 . They stayed for over 3 hours, got on like a house on fire with my lovely team, and we had a wonderful time of prayer with them….and seeing them for as much of Monday and Tuesday as we can…. Up from the grave he arose….. I guess I’m showing my age a little, but I always loved this hymn when I was a little boy (I think I’m still a little boy sometimes, just in a big boy’s body!! – Growing old is mandatory, growing up is optional!). My dad was a tenor in the London Male Voice Choir is the 1950’s, and I always remember loving the bass blokes singing, and then dad and the tenors adding to it, not that – then – I ha any idea of what bass and tenors were! And maybe as I’m getting older, I appreciate a lot more the words of many old hymns which had such depth, and were often profound, even if the tunes were naff – though this one is far from naff. And it’s wonderful truth, as is Stuart Townend’s amazing son, In Christ Alone. When it gets to ‘then bursting forth, in glorious day up from the grave he rose again’, and ‘bought with the precious blood of Christ’, I’m invariably wrecked with tears of utter thankfulness to the Lord of Lords and King of Kings… He did this for ME….he did it for you, and even if it had only been the two of us, he’d still have done it…..